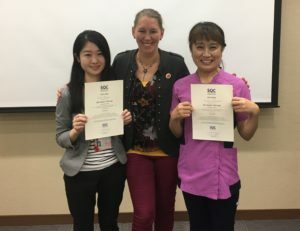 SQC arranged a number of seminars and workshops related to dementia care and Haptic therapy in Japan this month. With the help of our strong network we arranged the activities in Tokyo, Osaka and Oita. More than 200 persons joined our events that time. One of the highlights was when Emil Östberg and our dementia care expert Maria Bergström worked as consultants at a nursing home for a whole day. Advices on challenges the care staff were facing were given to them.. The day ended with a lecture about dementia care including a lot of time for Q&A. Our new certified Japanese instructors in SQC Haptic Therapy that passed their examination this time. This entry was posted in News on November 29, 2018 by .